K-Tuned Shifter Solutions - Shifter Cables - Pann Auto Performance - San Diego largest aftermarket automotive performance parts - What do you drive? Please note that modification to the rear engine bracket is needed. In the near future we anticipate that specific mounts for this engine and trans setup will become available. 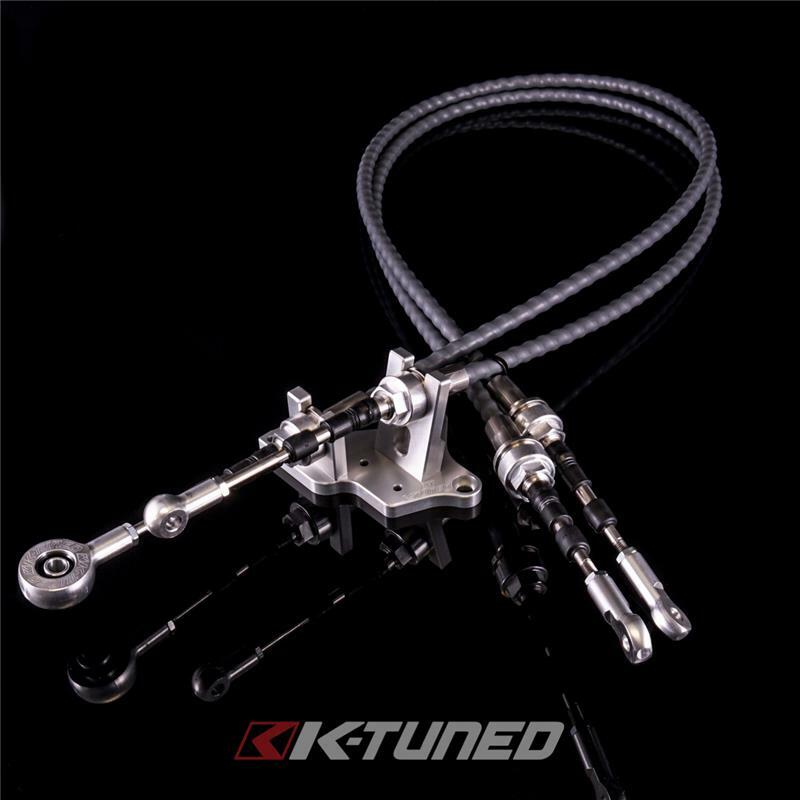 K-Tuned Race-Spec Shifter Cables and Trans Bracket are now available for the newest K24Z7 series transmission found in the 9th Gen Civic Si. It is not common knowledge yet but the K24Z7 (P3T) transmission bolts up to the older K20A/Z and K24A series engines. The side trans mount also matches the previous bolt pattern perfectly, which makes it compatible with just about any of the current K-Swap mount kits on the market today. However, there is one problem, modification to the rear engine bracket is needed in order to join the back of the trans to the subframe of the swap car. To make the shift setup possible, we designed a custom billet cable bracket that adapts the mounting positions on the trans side to match up with the popular and swap-friendly, 02-06 RSX cable positions. Note that some additional parts swapping is also needed in order to get everything working. More specifically, an RSX shifter and shift selector mechanism must also be used. All RSX shifters including the oem unit are compatible, as well as any RSX specific shifters from K-Tuned. The shift selector mechanism is located on top of the trans and is very easy to change, with almost no modification needed. Just drill and tap the two rear mounting holes and the selector will bolt up flawlessly. K-Tuned Race-Spec-Shifter Cables are a super strong and stretch resistant upgrade when compared to the weaker and failure prone oem cables. They are made almost entirely of stainless steel, including the very important inner cable and all of the exposed cable guides. Our cables are constructed with a low friction Teflon coated inner liner and polyethylene outer covering. Even the cable ends are made from stainless steel and were designed with a threaded section to eliminate the need for the oem cable clips. However, take note that the oem clips can still be used if desired. Last are the rod end connections, these are fully adjustable and made from 6061 billet aluminum at all four ends. We made one minor adjustment at the gear selector, here we are still using a billet rod end, but we added a spherical Delrin insert to allow proper movement at this joint. This slight movement helps reduce possible cable bind during shifting. We are so confident in our shifter cable design that we even offer a 1 year replacement and limited lifetime warranty. 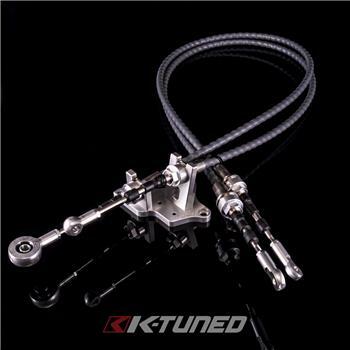 If you are looking for the best K-series shifter cables available, your search is now over.